After an enjoyable rest day Monday, I was back into training Tuesday. 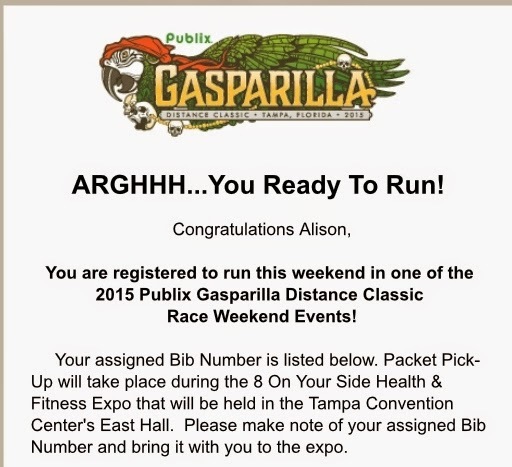 This weekend, Kristin, Mari and I are going to Tampa to run the 15k and half marathon at Gasparilla! Have I ever mentioned that Matt used to all me Pirate? This pirate-themed medal is going to be perfect for me! I feel a little insane to be running 22 miles this weekend, but we all just want to go and have fun. I haven't had a girls' weekend away in over a year, and I'm really looking forward to it! We originally wanted to sign up for one of the challenges, but they all sold out, so we just signed up for two races instead. 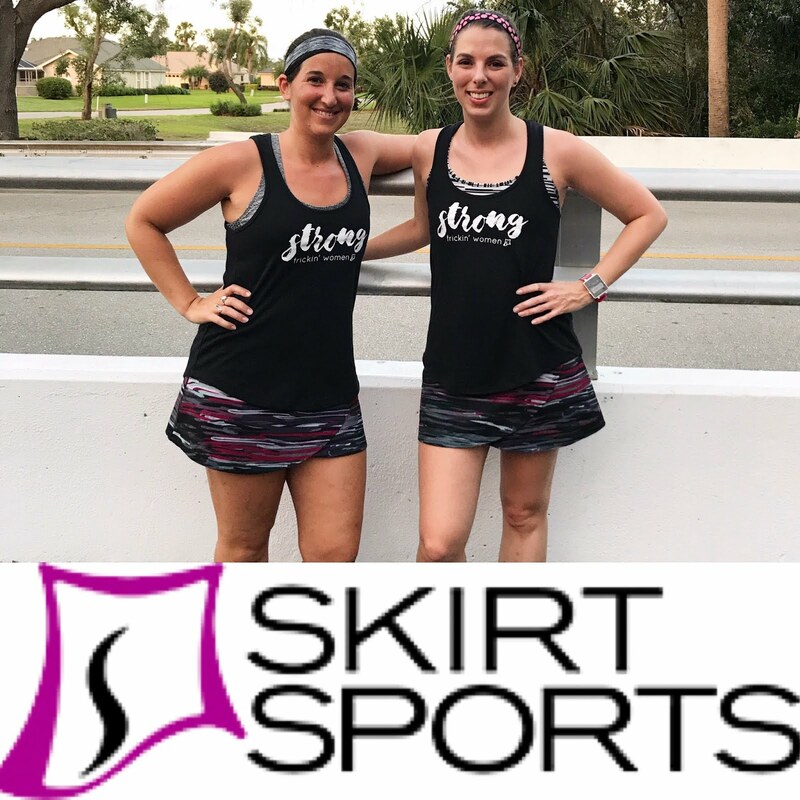 Kristin and I ran Tuesday. My calves were pretty tired but overall I felt good. And she brought me a treat! Gluten free Girl Scout cookies! Archie is totally checking out those cookies. Also, 91% humidity?! WHAT IS THAT?! And here I'd been enjoying the cooler weather! Matt has perfect eyesight, so he signed up just for me! I never win anything and I've been wanting LASIK for years. The worst thing about running early in the morning is sticking my contacts in (hashtag runnerproblems, right? ); I can't see a dang thing without them. I have my consultation March 7 and I'm hoping I'm a candidate and will have fixed eyeballs by spring break! Sign up for both the A1A and the Space Coast marathons has already opened. I really want to run the full at Space Coast again, but I'm waiting to sign up. Matt has expressed some interest in running a half with me, so I'm hoping to get him to sign up for the A1A next year with me. It's on Valentine's Day next year, so it would be such a fun race to train for and run together! I have a lot of big-distance races in the near future. The more I run long-distance, the scarier 5ks seem. But I'm looking fear in the face and running Kristina's virtual race! The funds go toward her fundraising for the Chicago marathon and help a really good cause: PAWS Chicago. C'mon...how can you say "no" to that happy puppy?! Do you ever sign up for races just for the medal? My eyesight is great since I got LASIK! I really hope you're a good candidate. It was life changing for me. It wasn't perfect... if you want more details I'd be happy to discuss it in more detail in an email, but I would still do it again in a heartbeat. Have fun this weekend! Are the 15k and half on back to back days? Or on the same day? That would be crazy! But if you can run a full, you can obviously do it. I'll definitely email if I think of any questions! I know it may not be perfect but if I can stop wearing contacts everyday, I'll be thrilled! I saw your Lasik post on FB- I am so freaking happy for you!!!!!! :) I can't read things far away and I have bad depth perception at night. I only wear my glasses when I go to the theatre or the movies. Priorities, right? I signed up for Kristina's virtual race, too! I gotta check the dates to make sure I do it in the right time frame. My night vision is SO BAD. I make Matt drive at night all the time. It will be nice to not be dependent on lenses. I had laser eye surgery back in 2001....loved it!! Then my eyes regressed...back to wearing glasses....and of course I'm old now...LOL...so bifocals will be in my future. LOL I totally get your excitement though! Have fun running the 5k....that is a fantastic cause!!!! I know eyesight is more likely to regress especially for reading glasses. My dad had his done in 1999 and it's still good, so I'm hoping I have a good outcome too! Congrats on the LASIK win! That's so exciting! I signed up for A1A just for the medal. I wasn't going to run it since I ran the Fort Laud. Half in November, but I thought the medal represented the city really well so I went for it! I still can't believe how big it is! 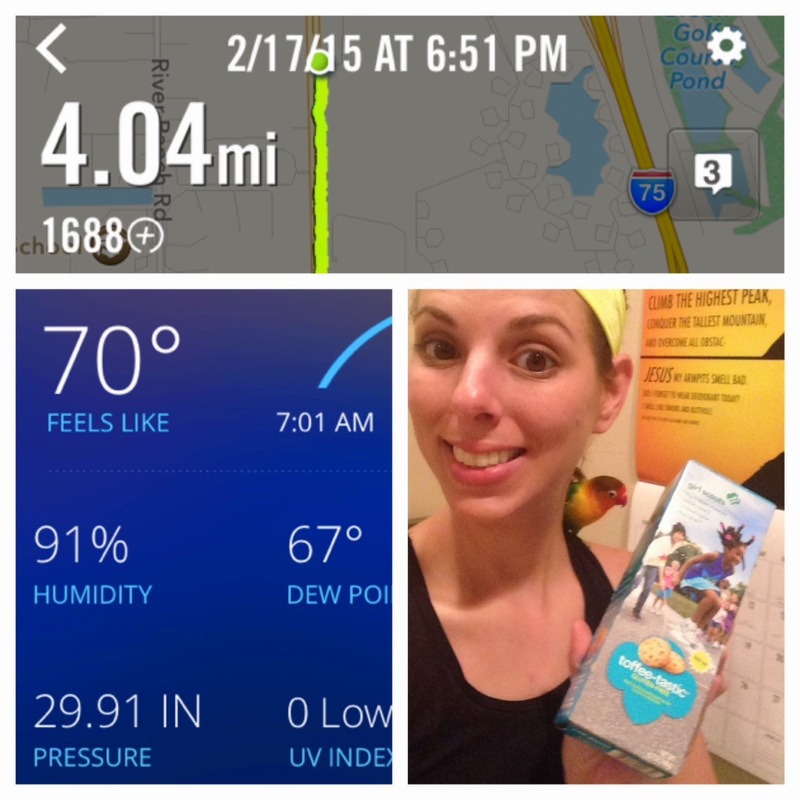 Thank you for the virtual race shoutout and for signing up! I really appreciate it! I'm planning on running your race this week...I just haven't decided when exactly! Ask Dad about his Lasik. Just before your Bat Mitzvah. 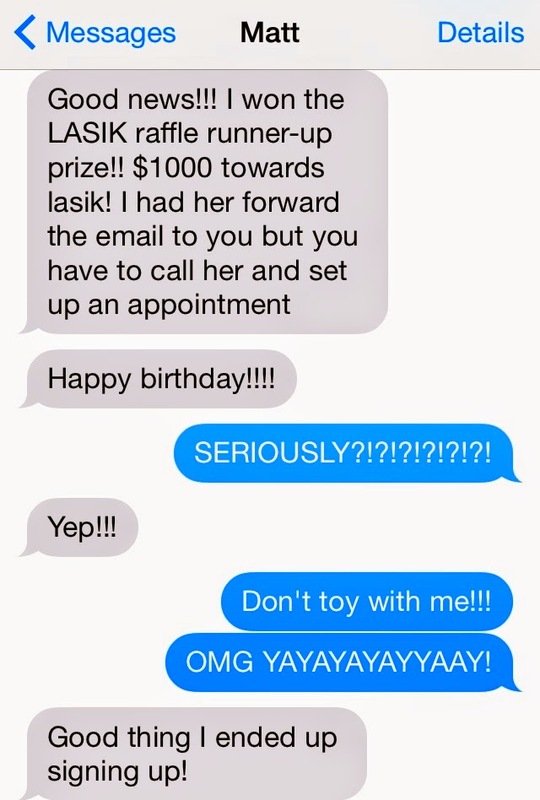 Ah that's so awesome you won the LASIK!! I want to get it done SO bad. I can't see anything without my contacts in or glasses on, and I dream of the morning when I wake up and can see everything perfectly. My mom and sister both got it done and love it! Good luck and have fun at your races this weekend! The worst part of running in the morning is sticking contacts in! Have you looked into getting LASIK yourself? Too scared of Lasik. I wear contacts for working out and glasses the rest of the time. I've been wearing them since I was six and they are a part of me, I can't imagine not wearing them. Your marlin medal was amazing, for that I could see running a race. Otherwise I don't run for medals though it's always nice when it's a good one. It's always been Thin Mints for me. And they're vegan! I've worn glasses since kindergarten, too, and used to lose my glasses on purpose all the time. They drive me nuts!